pretix can send webhook calls to notify your application of any changes that happen inside pretix. This is especially useful for everything triggered by an actual user, such as a new ticket sale or the arrival of a payment. 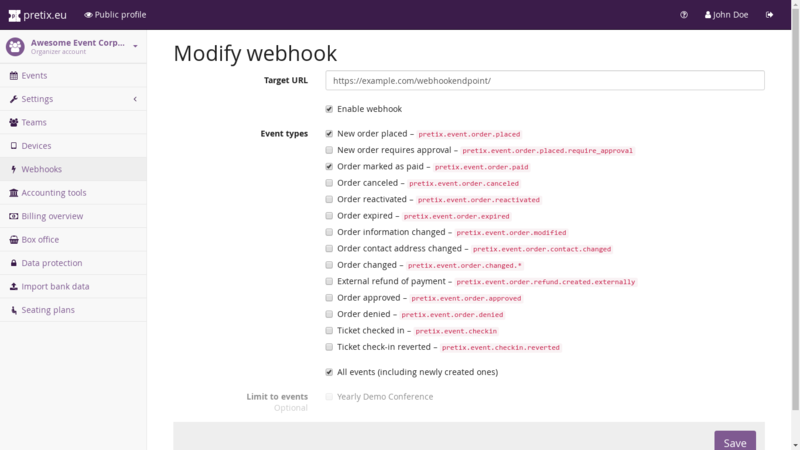 You can register any number of webhook URLs that pretix will notify any time one of the supported events occurs inside your organizer account. A great example use case of webhooks would be to add the buyer to your mailing list every time a new order comes in. Click “Create webhook” if you want to add a new URL. You will then be able to enter the URL pretix shall call for notifications. You need to select any number of notification types that you want to receive and you can optionally filter the events you want to receive notifications for. 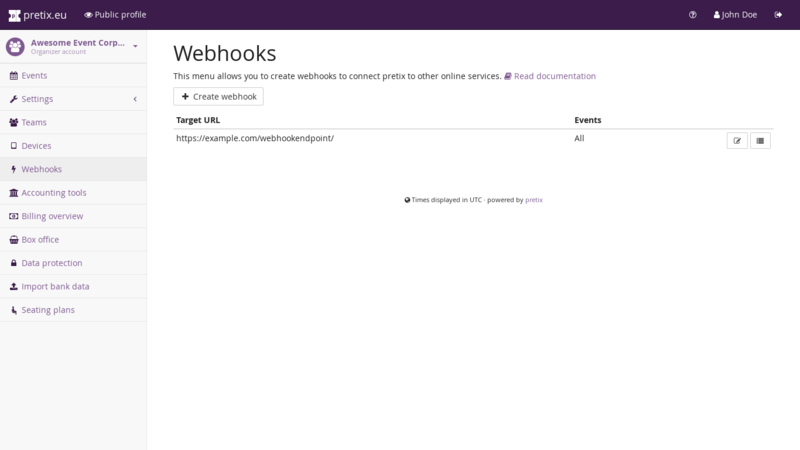 You can also configure webhooks through the API itself. Creating a webhook endpoint on your server is no different from creating any other page on your website. If your website is written in PHP, you might just create a new .php file on your server; if you use a web framework like Symfony or Django, you would just create a new route with the desired URL. More samples for the language of your choice are easy to find online. Notifications regarding a check-in will contain more details like orderposition_id and checkin_list. You should not trust data supplied to your webhook, but only use it as a trigger to fetch updated data. Anyone could send data there if they guess the correct URL and you won’t be able to tell. Therefore, we only include the minimum amount of data necessary for you to fetch the changed objects from our REST API in an authenticated way. If you want to further prevent others from accessing your webhook URL, you can also use Basic authentication and supply the URL to us in the format of https://username:password@domain.com/path/. We recommend that you use HTTPS for your webhook URL and might require it in the future. If HTTPS is used, we require that a valid certificate is in use. If you use a web framework that makes use of automatic CSRF protection, this protection might prevent us from calling your webhook URL. In this case, we recommend that you turn of CSRF protection selectively for that route. In Django, you can do this by putting the @csrf_exempt decorator on your view. In Rails, you can pass an except parameter to protect_from_forgery. If you successfully received a webhook call, your endpoint should return a HTTP status code between 200 and 299. If any other status code is returned, we will assume you did not receive the call. This does mean that any redirection or 304 Not Modified response will be treated as a failure. pretix will not follow any 301 or 302 redirect headers and pretix will ignore all other information in your response headers or body. If we do not receive a status code in the range of 200 and 299, pretix will retry to deliver for up to three days with an exponential back off. Therefore, we recommend that you implement your endpoint in a way where calling it multiple times for the same event due to a perceived error does not do any harm. There is only one exception: If status code 410 Gone is returned, we will assume the endpoint does not exist any more and automatically disable the webhook. If you use a self-hosted version of pretix (i.e. not our SaaS offering at pretix.eu) and you did not configure a background task queue, failed webhooks will not be retried. If you want to debug your webhooks, you can view a log of all sent notifications and the responses of your server for 30 days right next to your configuration.